TORONTO CATHOLIC WITNESS: Cardinal Gerhard Muller: separating pastoral practice from doctrine is a: "subtle, but serious Christological heresy". Cardinal Gerhard Muller: separating pastoral practice from doctrine is a: "subtle, but serious Christological heresy". The Prefect of the Holy Office, Gerhard Cardinal Muller, had these words to say to the International Theological Commission. I have been unable find any information about the Cardinal's statement in an English translation; hence, once more I am turning to the excellent Polonia Christiana to place before us the facts. The same news agency that brought to the world Bishop Athanasius Schneider's analysis of the Synod, especially the mid-term relatio. Polonia Christiana also carried an important news article in which the same Cardinal commented that a number of bishops at the Synod had been "blinded" at the Synod of the Family with regards to the indissolubility of marriage and homosexuality. Much has been made about not overturning doctrine (vis-a-vis the indissolubility of marriage, or the intrinsically evil nature of homosexual acts); just changing pastoral practice. 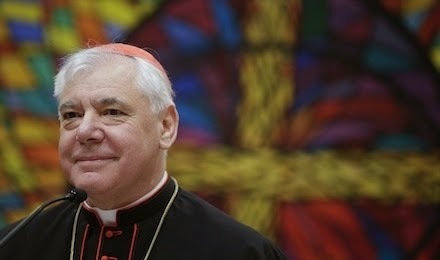 Cardinal Muller responds to this: [it is a] serious Christological heresy". Gerhard Cardinal Muller recalled the closely relationship between doctrine and pastoral practice to the opening session of the International Theological Commission. "Any separation of theory from practice of the faith would be a subtle, but serious Christological heresy", said the Prefect of the Congregation for the Doctrine of the Faith, who is also the President of the Commission. He objected to the treatment of theology as a field detached from the life of the faithful. "This is not true theology. In true theology, the understanding of the faith is never separated nor opposed to the pastoral care and experience of faith. Theology always has a profound pastoral dimension", said Cardinal Müller. He also said that in the opinion of the Fathers of the Church, theology is always born in the liturgy, in the adoration of the mystery of God, and the Word that became flesh. He recalled the special responsibility of theologians. "The Christian faith is not an irrational experience. We, theologians, are the guardians and promoters of the rationality of faith. Through the mediation of the Christological God gives us understanding, likewise through reason His self-revelation", Cardinal said. Müller at the opening session of the International Theological Commission. I agree with Cardinal Muller. Pastoral practice should closely follow doctrine. I read that Pope Francis is simply trying to integrate the divorced/remarried back into Catholic life. He mentioned several things divorced people can't do like teach catechism, read at Mass, become god parents. He didn't seem to be saying this should change, he just gave us examples. But if he were to ask me, I think divorced/remarried often are fully integrated in parish life, and there are numerous ways that they can serve. But reading at Mass would be a scandal. They shouldn't be godparents until their own marriage is blessed, and no they shouldn't teach catechism. I am horrified by how many validly married Catholic couples teach catechism and think NOTHING of using artificial birth control. Now, divorced remarried can't join the Legion of Mary because that is only open to practicing Catholics, who are free to receive the sacraments. However, I had a few people join who were not validly married, and my approach was to tell them they needed to get their situation regularized before they could take the Legion promise, which is taken within six months of joining the Legion. This was a carrot and stick approach. Get your marriage fixed, and you get to do door to door evangelization with the rest of us! They were --under our rules -- not members until they took the promise, and they either had to take the promise within six months or leave the Legion. However, there is another apostolate that did help people in this state enormously, and that is Eucharistic Apostles of the Divine Mercy. We did have one irregularly married wife join the group, and she went through a conversion. She and her husband were living as brother and sister and going to daily Mass, but the pastor ordered them not to receive because of the scandal -- the two of them living together. That's when the husband decided to fill out annulment papers. Their marriage was blessed by the Church. The Divine Mercy ministry helped the process. Divorced remarried Catholics have also joined Disciples of Jesus and Mary, a formation program in prayer, discernment and discipleship. IN some cases, it took a few years, but God worked miracles so their marriages were eventually blessed. I'll never forget their happiness once they were free to receive communion again. Before that, they went up to communion with their arms crossed across their chest to receive a blessing. Many times I saw tears coming from their eyes. I agree with the pope that we need to pastorally work to integrate divorced and remarried, but withhold communion so people can be encouraged to regularize their situation. Not all the divorced remarried situations ended so happily. In one case the wife simply divorced the husband. She tried to live as a sister, but this created enormous hostility. He was not willing to let her reintegrate with her faith.